Fortnite which are some of my favorite to write guides for They ask you to pinpoint a location between three landmarks on the map, some well-known, others you may never have heard of. Fortnite players are being asked to search between a giant rock man, crowned tomato and encircled tree. Go here to see all of week 5's challenges. this, we have to head to the region of Tomato Temple, which you may have guessed from the crowned tomato bit, which is obviously the giant crown-wearing tomato head sitting on top of the temple. And finally the giant rock man is a statue that I hear is rumored to be… moving over time? But I haven't seen any evidence of that. It's a bit east of Tomato Town and worth visiting because it's usually sitting on a chest and giving you a whole bunch of stone if you hack him down. So where's your prize? That would be in the middle of all of them, just south of the covered bridge connecting two hills at Tomato Town. The battle star will be on a dirt patch right next to the southern bridge on the left. And there you have your battle star. Search Between challenges are easy when you have a guide to the exact spot, which is why I enjoy writing them. Tomato Temple is a place where you can go to Tomato Temple, which is not a place where you can go to play a real game here. We are only two weeks away now from the reveal of the legendary Snowfall skin, which you will get if you complete seven full weeks of challenges some time this season. If you ask me, this is one of the easier weeks, so I would definitely make this challenge and all the others, especially if you're going for the Snowfall skin as soon as it arrives in Fortnite in season 7, week 7. Facebook and ] Instagram . Read my new sci-fi thriller novel Herokiller available now in print and online. I also wrote & nbsp; The Earthborn Trilogy . It took an entire season, but Search Between challenges are back in Fortnite which are some of my favorite to write guides for. They ask you to pinpoint a location between three landmarks on the map, some well-known, others you may never have heard of. And this week Fortnite players are asked to search between a giant rock man, crowned tomato and encircled tree. Go here to see where to dance in specific locations. Go here to see all of week 5's challenges. The encircled tree is south of Tomato Temple on a hill, a singular tree surrounded by stones, and a landmark that I would not expect you to recognize. 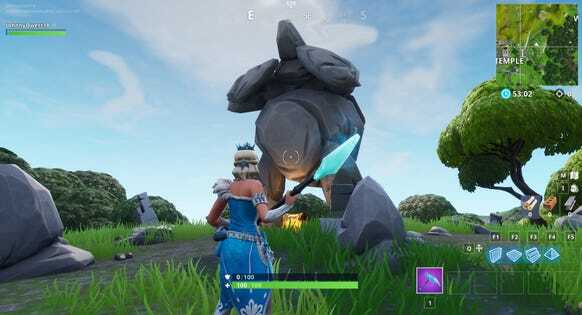 And finally the giant rock man is a statue that I hear is rumored to be moving over time? But I haven't seen any evidence of that. It's a bit east of Tomato Town and worth visiting because it's usually sitting on a chest and giving you a whole bunch of stone if you hack him down. Here's where that's exactly on the map if that's more helpful. If you're zoomed out, you're going to be in the temple of the largest world map, thereabouts. I hope we see more of these Search Between challenges as I believe this is already the second this season, and while Epic is at it, I wouldn't mind them putting treasure maps back in the game either, if those were a lot of fun as well.